Meet Marguerite Adzick, founder and CEO of Addison Bay, a Philadelphia-based online retailer and premier multibrand destination for fashionable activewear. 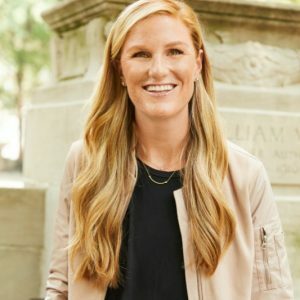 The Addison Bay website, which launched in September, is the project of 30-year-old Adzick, whose career in the fashion industry was preceded by her time as a collegiate athlete. Wanting to bring both high-style and high-function activewear into one convenient online shop, Adzick decided to create Addison Bay. Adzick is the subject of our latest installment of the Inner Circle Q&A! Inner Circle: Tell us about your background. Marguerite Adzick: I grew up in Wyndmoor, Pa., which is about 30 minutes from Center City Philadelphia. I attended The William Penn Charter School and went on to The University of Virginia, where I played lacrosse. After graduating, I moved back to the Philadelphia area and worked at Lilly Pulitzer’s headquarters for six years, managing and producing all photography assets for the company. In an effort to marry my two biggest passions, fashion and fitness, I developed the concept for Addison Bay — all while I was pregnant with my first child. I started writing the business plan when I was pregnant, and have since then had my first baby, who is now three months old. Having a baby and launching a company has been completely crazy, but I felt like there was no time like the present. I always wanted to start a company by the time I turned 30, and I turned 30 two days after the launch, so just barely made my goal! IC: Tell us about Addison Bay. What types of products do you sell and what makes the brand unique? Also, what does the name mean? MA: Addison Bay is a multibrand active fashion company, curating the best assortment of fashion-forward activewear in one place. The vision for the company is simple: to help consumers achieve activewear looks that are equally stylish and functional. We believe the modern woman wants to stand out and express herself, and she shouldn’t have to sacrifice personal style just because she’s exercising or wants to be comfortable. The brand meticulously curates a diverse collection which has more than 30 different activewear labels for their fall/winter 2018 season, including coveted brands such as Splits59, PE Nation, Koral, LNDR, Monreal London, Michi, Nylora, Onzie, Terez and Varley. Addison Street is my favorite street in my hometown of Philadelphia. My husband and I were living there during the inception of the company, when I really started to see active fashion become more prominent and a permanent lifestyle. It’s a walkable, tree-lined, residential street in Philadelphia, which begs for residents to get outside, enjoy its white twinkling lights, and chat with neighbors. Bay comes from growing up and swimming in the bay in Avalon, N.J. To me, it signifies an active lifestyle, where I learned how to swim against the tide and get out of my comfort zone. IC: What was the reason you started Addison Bay? What was the white space you saw that you felt needed to be filled? MA: As a woman on the go, balancing being a mother and entrepreneur, I wanted to develop a one-stop space where activewear went beyond just the time spent at the gym, where fashion-forward didn’t mean less function and looking good is feeling good. I saw white space in the activewear market, where it was difficult to navigate purchasing fashion-forward activewear online. In an effort to create a solution, Addison Bay is merchandised beyond the product class into practical uses for everyday life, including more sweat, less sweat, on-the-go, cozy and highlighting popular fabrications. IC: How do you promote and market your products and brand? For example, do you work with influencers or use any other social media tactics? MA: We’ve invested in digital advertising and influencer marketing. Our business plan is focused on building digital first in an effort to increase brand awareness as well as develop sales. We’ve also strategically focused on traditional public relations (broadcast, print and online), pop-up events, and co-branding with other established brands. IC: What advice would you give to women thinking about starting their own businesses, or at least side hustles? MA: LET. IT. RIP. Don’t hold back because you’re unsure or scared. The sky is the limit. I believe if you can put your head down, focus on your goal and block out the noise, you can go so far. I also believe in supporting other women. I’ve had so many amazing female entrepreneurs take the time to speak with me and give me their valuable insight. I’m definitely going to pay it forward and help in any way that I can. IC: What’s next for Addison Bay? What are your goals for 2019 and beyond? MA: Currently, Addison Bay carries 35 brands and we plan on expanding our assortment to 40-50 brands in the next year. We’re also very interested in carrying our own line of Addison Bay activewear and opening a brick-and-mortar location in Center City Philadelphia in the next several years.